On the island of Gomera was reported to me by Melanie that she used to suffer from paralysis, was caused by an earlier meningitis. When she had the opportunity years ago to meet the pilot whales and to be with them several times and swim, this disease pictures are gone. Her whole life had changed as a result. She decided to settle on the island, married, and lives there with her ​​family and is since then for the protection of these animals. 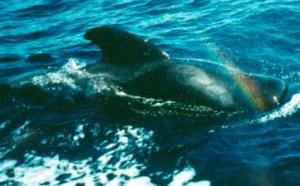 The pilot whales have a strong healing effect, which is also confirmed by other therapists over again. For many years we organize repeatedly encounters for people with these animals and it is shown that above all cures are observed in the emotional and also in the spiritual realm.